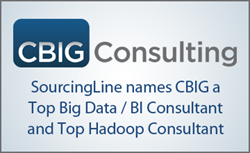 Independent research firm names CBIG Consulting a Top Big Data and BI Consulting Company and a Top Hadoop Consulting Company. Washington D.C.-based research firm SourcingLine published its latest findings this week focusing on Top Big Data and BI Consulting Companies, and separately Top Hadoop Consulting Companies, identifying CBIG Consulting among a handful of companies that made it on both lists. Using its proprietary Leaders Matrix framework, SourcingLine’s results stem from a quantitative analysis that maps a firm’s services against its record of successful delivery and client satisfaction. CBIG is one of a small number of firms that made both the Big Data and Hadoop listings because its comprehensive service offerings and performance record were exemplary in both categories. SourcingLine publishes companion directories for Top Big Data and BI Consulting Companies and Top Hadoop Consulting Companies to give data-driven client buyers a resource search tool with a range of filters designed to help in choosing consultants that best meet their needs relative to services. CBIG Consulting is an international team of experts in Data Warehousing, Business Intelligence, Big Data Analytics, and Cloud-based Analytics platforms. Selected in 2013 by independent research firm SourcingLine as well as CIO Review as a leading big data/data analytics consulting firm, CBIG consultants average fifteen years of direct experience in the field. CBIG works with global enterprises, mid-size businesses, and non-profit organizations in solving mission-critical reporting and analytical needs. CBIG is headquartered in the Chicago, IL area, and has additional offices in San Francisco, CA, Boston, MA, Denver, CO, Austin TX, Raleigh, NC and Sydney, NSW, Australia. For more information, please visit http://www.cbigconsulting.com.